The RHS Varsity girls soccer team braved the cold and windy weather on Friday to compete in a OAA/Catholic High School League crossover match against Mercy HS. The Falcons started the match out strong, taking over possession of the match, and shutting down the Marlin’s attack. Junior Sidney Swart struck first toward the beginning of the match striking the ball towards the bottom right corner of the net assisted by Mackenzie Smith. The remainder of the first half was pretty even as Mercy changed tactically and the ball stayed in the middle third of the field. The Falcons remained intense and created chances in the second half, finally put the game out of reach around ten minutes to go in the game. Senior Kaitlin DuCharme made a box to box run with the ball, dribbling around six players before laying it off to freshman stand-out Lizzie Jewell. Jewell bounced it to sophomore Nicole Miller who chipped the Mercy keeper from 25 yards out to go up 2-0. 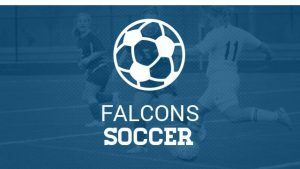 The Falcons earned their 32nd shutout in four years under the tenure of Senior Goalkeeper Kaitlyn Godwin who had to make 7 saves to keep the clean sheet. The JVA team won against Mercy after being down 1-0 the majority of the match. Then with the wind and 15 minutes left in the game, the Falcons unleashed a formidable attack, scoring 5 goals and winning 5-1. Maddie Crossley, Sophie Yanachik, Julianna Cockell, and Ruby Welch all scored for RHS, Welch scored twice. The JVB team lost 3-1 against Stoney Creek. Scoring for the Falcons was Caroline Bulat.